Arjun Kapoor Just Questioned Gender Inequality While Writing News Headlines And we Respect Him For This! 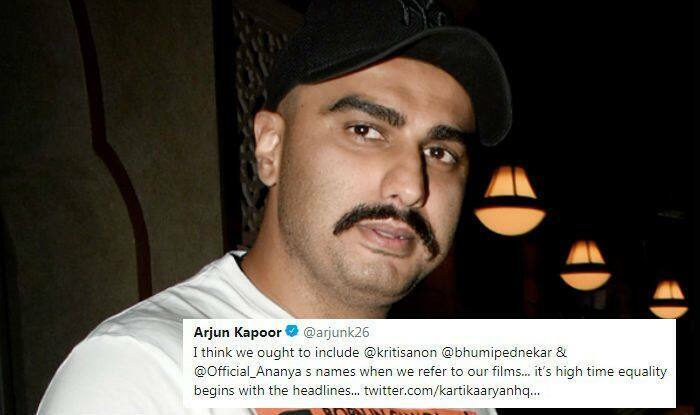 Arjun Kapoor pointed out how a news article only mentioned him and Kartik Aaryan in its headline and not the actresses. Actor Arjun Kapoor has done something quite applaudable. He took to Twitter recently and mentioned how news articles while comparing two films, should not only write about the male actors in the headlines. It’s a tiny thing that Arjun took notice of but something really substantial that can bring gender equality in the way news articles are written since always at most places across the world. Films that feature both male and female actors are written about as if only the male lead matters. Arjun questioned the same psyche and posted about it on Twitter. He, quite rightly, pointed out that his film doesn’t only belong to him but to the female actor in the film too. Similarly, actor Kartik Aaryan‘s film is not just his film but also about the female actors – Bhumi Pednekar and Ananya Pandey, featuring in it. Therefore, it’s sexist to mention the names of just the male actors in the headlines. Earlier, taking another tiny but prominent step towards equality, actor Shah Rukh Khan had announced that the name of the actress in his films will be mentioned above than his name always. He discussed this while promoting his 2013 release Chennai Express. SRK made a change in the credits of his film and had Deepika Padukone’s name above his name on the big screen. On the work front, Arjun is currently shooting for his upcoming film with Ashutosh Gowarikar. Titled Panipat: The Great Betrayal, the film also features Kriti Sanon and Sanjay Dutt in important roles. It’s slated to hit the screens on December 6 this year.